Roger Dean Stadium, Jupiter, FL. Nov. 16,2013 – The San Antonio Reds wasted little time in taking control of the 45-Central championship game scoring five runs in the opening frame and cruising to an 11-1 win over the Venezuelans. Co-MVP Rafael Fuentes drove in the first two runs with a single followed by Rex Delanuez plating a run with a fielder’s choice. Phil Ross singled in the final two runs to round out the first inning scoring. Pitcher Greg Bertrand, who shared the MVP honors with Fuentes, pitched a complete game allowing one run on just five hits, with no walks and five strikeouts. Three of those five hits came in the sixth inning when San Antonio already led 7-0. It was Bertrand’s second complete-game win of the tournament. The Cuban-born Fuentes, meanwhile, not only led the team in hitting and RBI, but was also 2-0 on the hill. “He’s been our leader all week.” said manager Phil Galloway. 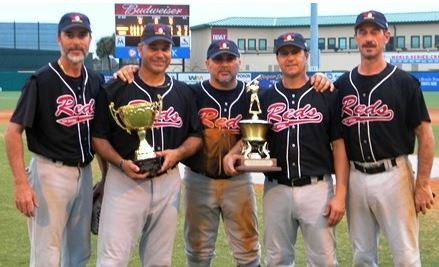 “He contributes in so many ways, and leads by example to all the guys.” Fuentes has been playing MSBL for 24 years and owns 11 championship rings from MSBL tournaments. Fuentes had two doubles in the Reds 15-4 win over Periodistas de Carabobo (VZ) earlier the same morning. Venezuela earned a hard-fought, 12-10 semi-final win over the Kennett Blue Rocks in the morning semifinal held on one of Roger Dean’s auxiliary fields, and then double-timed it to the stadium for the finals. They were hoping to avenge an earlier 7-5 round robin loss to the Reds, but it wasn’t to be. Still, said manager Robert Sosa, “I’m very proud of my team. They showed great heart and played hard, but I congratulate (the Red). They are a very good champion” said Sosa, as he smiled while accepting the runner-up trophy. For Galloway and Fuentes this win was special. The Fort Worth team was nearly disbanded when one of its organizers was forced to deal with a health issue, but Galloway and Fuentes, who also manages Team Victory in California, were able to keep eight on those players together – and it’s hard to argue with the results. “We’ve also won three titles in Phoenix with many of these same guys” added Galloway, referring to the San Antonio Bombers. For the manager, this was his sixth MSBL championship. So as the lights were being turned off after 40 games at Roger Dean Stadium — the spring training home of the St. Louis Cardinals and Miami Marlins — the winning manager of the last team to win a ring at the 2013 Fall Classic, carried the championship trophy in one hand, his bat bag in the other, and headed out into the South Florida night already thinking about next year.